Flappy Bird may be gone, but while many are mourning its passing, others are seeing a rather drastic market opportunity. Within hours of the game disappearing from the App Store (seemingly) forever, listings have turned up on Ebay selling iPhones that have the game installed. At time of posting, the "cheapest" offer was for an iPhone 5S at $650 (it's already got one bid), while you could buy a 32GB gold iPhone 5S for $1500. Used. Note that an unlocked iPhone 5S is $750 in the US. That's brand new, sealed in the box, straight from Apple. Before you laugh at these morons, look at the phone in your own hand. 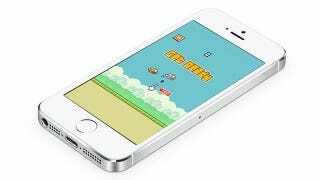 If it's a relatively recent iPhone, and you have Flappy Bird installed, you no longer have just a phone. You have a piece of history, one that you too could put on eBay, charge stupid prices for then have nobody pay.